R.I.P. the possibility of an all-day McGriddle. If you’re a fan of McMuffins and hash browns, chances are you’re well aware of the nationwide McDonald’s all-day breakfast drop starting this October. As the world waits in anticipation, some lucky few have received a special sneak peak into what a world with all-day breakfast might feel like. 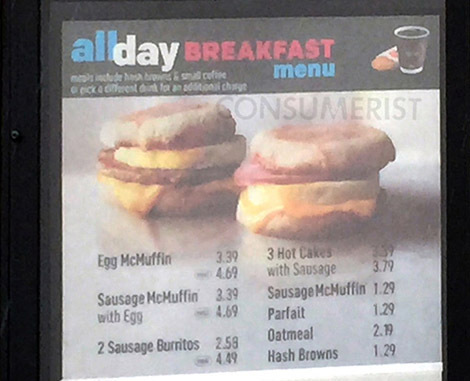 A Northern California resident recently spotted an all-day breakfast menu at his local McDonald’s. Just as we reported, the menu was exclusively Egg McMuffin-themed, giving customers the option of indulging in various sandwiches with a possible side of hash browns, oatmeal, or yogurt. The all-day breakfast options coming this October will give McDonald’s restaurants across the nation the choice to feature either an Egg McMuffin-themed menu or biscuit-themed foods—not both. Customer preference will play a huge role in the decision of which menu will be featured at each restaurant, so if you’re lobbying for a biscuit-centered menu, it won’t hurt to stop by your local McDonald’s on your way to work and pick up a few sandwiches to prove your loyalty to your preferred breakfast item.